Karuna Owens (left) and Tashi Jackson display the funds collected in a fundraiser at the Basalt Middle School to help wth Nepal aid. Both girls were adopted as babies from Nepal. 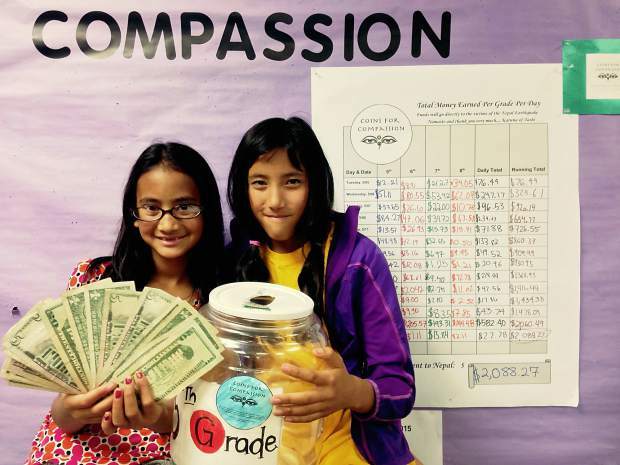 Two fifth-graders at Basalt Middle School raised $2,088 to help aid Nepal earthquake victims in a project that had special meaning to them. Karuna Owens and Tashi Jackson, both 11, were adopted from Nepal as babies. Both students have visited Nepal recently and both have family and friends affected by the deadly and destructive April 25 earthquake and its aftershocks. Owens and Jackson enlisted teachers and the student council to set up a “penny war” fundraiser called Coins for Compassion. They cited librarian Jane Douglass as particularly helpful. They launched the effort by creating a slideshow that was shown to students in every classroom at Basalt Middle School. Pennies equate points for each grade while coins such as nickels, dimes and quarters — or dollar bills — subtract points in a penny war. The fifth-grade class won, inspired by the efforts of Owens and Jackson. The fundraising effort spread outside of Basalt Elementary School during the three-week campaign. Businesses such as Saxy’s and Mountain Greenery put out collection jars and some Basalt-area residents made a special trip to the middle school to donate. There was a big surge on the second-to-last day of the campaign, May 21, when $582 was raised. The total came to $2,088.27. Jackson decided to divide her share among four organizations. She donated $250 to rebuilding the villages of Khumjung and Pangboche in Khumbu, Nepal, where she was born. Another $250 was donated to the Tsering Fund to help provide food, water, shelter and supplies to villages in need. She also contributed $250 to the Rasuwa Relief Fund in the Rasuwa area, where the village of Langtang was hit by an avalanche that buried many people. Her final share of $250 was donated to Friends of Maiti Nepal, which helps orphaned girls and provides a home to rescued women and children. Owens contributed her entire share to the Cloudbase Foundation — a nonprofit made up of hang-glider and paraglider pilots from around the world who help the communities where they fly. The fundraising effort dovetailed with the Roaring Fork School District’s Habits of a Scholar Initiative, which was launched in 2014. It highlights five characteristics that are critically important for students to cultivate. One of those traits is compassion. Jackson said the campaign showed that anything is possible with support. “I want to thank everyone for extending a hand of compassion to the people of Nepal and especially to Ms. Douglass for helping us achieve this goal,” she said.